The Kenwood L-07D offers a host of performance features. The deck offers world-class performance in the areas of speed accuracy, absolute speed stability, high transient load characteristics, high rigidity, anti-vibration properties and tonearm quality. So is this the "perfect deck"? Did the Kenwood engineers "get it right" on every single design issue? The answer to both questions is no. The L-07D has a significant flaw that was not adequately corrected by the original design. The powerful motor generates a surrounding magnetic field which is located beneath the phono cartridge during playback. The phono cartridge is an electromagnetic transducer, which also generates its own magnetic field. The interaction of these two magnetic fields in the L-07D results in sonic problems that are appreciable during playback. Firstly, the sound stage is compressed. Secondly, the tonal variation is reduced and there is a roll-off of the upper registers. A decent belt drive such as the Gyro Dec will put out a noticeably superior sound stage and a wider tonal palette compared to the L-07D. This is because in a belt drive turntable, there is no motor under the phono cartridge emitting electromagnetic energy (EMI) and/or radiofrequency energy (RFI) which can effect the phono cartridge and/or tonearm wiring. When the EMI and/or RFI fields generated by the motor of a direct drive turntable interact with the phono cartridge and/or tonearm wiring, and conversely when the EMI and/or RFI fields generated by the phono cartridge interact with the motor, the negative effects are audible. The result during playback, of EMI and RFI, is a reduced sound stage and a diminished treble response. This removes the delicacy and detail from the playback. The tonal range is also reduced. The sound stage is compressed. Stereo separation is reduced. The unmodified L-07D is a great performer, but its sound has been rightly criticized as being somewhat dull, flat and two-dimensional. In a recent "shootout" with the Gyro Dec in the April 2005 issue of Hi Fi World, the Michell was noted to have "far superior imaging and staging, nicer and yet more varied tonality, and a more musical and emotive take on the proceedings". The L-07D was noted to "run with metronomic precision, faithfully capturing the starts and stops of notes and thus every instrument in the mix - and was thus by far and away the better focused and detailed." The article concluded: "Combine their respective strengths, and you'd have the best turntable in the world.....Of the two decks' respective failings, I think the Gyro's are more serious. Real attention to detail in placement and setup may pull a bit more tonal color and imaging capability out of the L-07D, but it wouldn't make the Gyro time any better"
Well, thank goodness that the L-07D engineers got the timing right. The engineering that was put into the L-07D to conquer speed accuracy, absolute speed stability, high transient load characteristics, resonance control, high rigidity and tonearm quality are not there in the Gyro Dec. In physics terms, a belt drive turntable is two rotating masses connected by a spring. The L-07D will always time better than a table of the Gyro Dec's design. But, it is the very nature of the L-07D's engineering that has introduced the flaw that squashes the sound stage and limits the range of tonality during playback: the motor and phono cartridge/tonearm wiring generate their own EMI and RFI that interact with each other in a very negative way. This phenomenon is not just heard during playback as a flattened sound stage and loss of tonal range (particularly in the upper registers). It is also heard during electronic braking. If the stylus is at the level of the inner grooves, and raised by the tonearm rest so that it is above the record surface, a distinct "'wum, wum, wum'" is heard through the speakers as the electronic brake is slowing the platter. This is a clearly audible effect of the motor on the phono cartridge. It is the "clue" that tipped me off to the problem and set me on a course to discover a solution. This is the only major flaw in the L-07D that I have identified, and it is a significant one. In the L-07D Discussion Group, we have previously tried to coax better sound out of the L-07D with mats and isolation, thinking the problem was elsewhere in the design. It is not. So then, is the L-07D "doomed forever" to narrow sound staging and limited tonality? Is this the price we must pay and accept for "Metronomic precision that faithfully captures the starts and stops of notes and thus every instrument in the mix " that is absent in belt drive turntables? The answer is a big no! With proper EMI and RFI shielding, the negative interaction of the motor and phono cartridge/tonearm wiring with each other via RFI and EMI can be eliminated with materials that were not available at the time of the L-07D's design. With the proper do-it-yourself (DIY) shielding applied, the improvement in sound stage, tonal spectrum and treble response are so improved that I am at a loss to find the proper quantitative superlative. Once you apply these simple tweaks, you can transform your L-07D into a deck that runs with metronomic precision and puts out a vast sound stage. Shielding the motor's EMI fields from the phono cartridge and tonearm wiring (and the phono cartridge's EMI fields from the motor) is as simple as putting an efficient physical EMI barrier between the two. The material of choice for this task is Mu metal. (Pronounced "mew" metal). This material is a sheet metal product that is approximately 80% nickel, 4% molybdenum, and the remainder iron. It is available commercially in 0.004 and 0.006 inch thicknesses. I am using the 0.006 inch thick variety. A single thickness completely eliminates the "wum-wum-wum" during braking, and resolves the sound stage and tonality problems described above. Simply cut out a circular sheet of this material the same diameter as the platter sheet, drill a center-hole, and place it between the subplatter and the platter sheet. EMI interference is resolved at a cost of approximately $25 USD. Does the box above contain the solution to the L-07D's sound staging woes? Voila Mu Metal! EMI shielding in sheet metal form. The "finished product" shown above. The shielding is barely visible without the DS-20 outer stabilizer in place (see below), but it is completely invisible with the DS-20 in place. 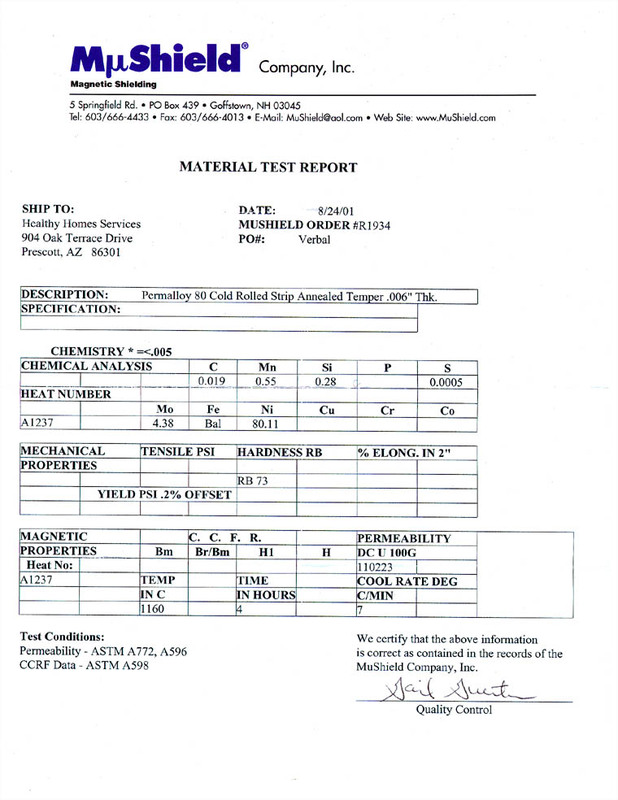 White paper on Mu metal shielding used on this page. Stillpoints makes a paper product called ERS that blocks RFI. It has many audio applications, and can be found on the TweekGeek website at www.tweekgeek.com. The paper comes in 8½ x 11 inch sheets. Thus, it takes two sheets to make a circle of ERS paper the same diameter as the platter sheet. RFI interference is resolved at a cost of approximately $40 USD. ERS 8½ x 11 inch cloth-paper sheet shown above. The ERS disc can be made from two pieces of ERS paper. Having made a few of these, I made the above disc from one sheet of ERS paper plus scraps left over from earlier discs made. I have been using the following solution: I use a sandwich of materials from bottom-to-top order of: subplatter, ERS disc, Mu metal disc and stainless steel platter sheet. The results are astounding! I believe that this solution will lay to rest prior criticisms of the L-07D's sound staging and tonal palette shortfalls. In the photo above, the fully EMI and RFI shielded L-07D platter is shown, with the ERS (blue arrow) and Mu metal (yellow arrow) DIY discs barely visible from side inspection beneath the platter sheet (green arrow). The result is, of course, invisible with the DS-20 outer stabilizer applied. Links to the sources for the materials used for shielding are located on the Links & Contact page of this website. Some additional thoughts on the subject: I wonder whether the "thumb holes" in the subplatter are EMI shielding defects. I think that it may be worthwhile to obtain a Gauss meter to measure the effects of EMI shielding and interference. It would seem apparent that the methods used above could enhance performance on any direct-drive turntable with similar afflictions. It is my understanding that the Onkyo PX-100M suffers from more pronounced EMI and/or RFI playback effects than does the L-07D. This subject has been discussed in the L-07D Discussion Group. Several L-07D owners have responded that they do not hear the "'wum, wum, wum'“ through the speakers as the electronic brake is slowing the platter. In my case, my Control Units are all fully rebuilt and upgraded, including the power-supply power-transistors. I wonder if my rebuilt units send more current to the motor during electronic braking than a Control Unit with 25-year-old all-original components. Interestingly, a multiple Technics SP-10 owner has commented in the L-07D Discussion Group that his SP-10 demonstrates the same "wum, wum, wum" as the L-07D during electronic braking. He further confirmed that the "wum, wum, wum" was completely eliminated with a sheet of Mu metal over the platter and under a cork mat covered by a rubber mat on his SP-10. However, he didn't like the sound. He stated that the image was less focused and more grainy. He theorizes that the Mu metal is itself magnetic, and can affect the cartridge. He theorizes that the sound of the L-07D is improved because the stainless steel platter sheet shields the cartridge from any magnetic effects of the Mu metal. An L-07D II owner that I know theorizes that the separate stator coils of the generation two motor generates less EMI than the star coils of the generation one motor. He does not notice any "wum, wum, wum" during electronic braking on his L-07D II with either moving-magnet or moving-coil phono cartridges. Even so, he has noticed improvements on his deck using the Mu metal disc, with "slightly silkier highs" . I have sent some Mu metal shielding discs to several L-07D owners. I have received only positive feedback thus far on the effects of the Mu metal disc on playback on the L-07D. I think some phono cartridges may better shielded than others from EMI, by design. I think the Mu metal mod is worthwhile if the motor is producing sound-degrading magnetic effects on a particular cartridge/table combination. If your anti-skate thread breaks, it is easy to repair yourself. An exact replacement for the original thread is 6-0 clear monofilament nylon surgical suture, Ethicon 689G. You can source this from most medical supply companies. The original anti-skate string end-caps are 3mm in diameter. The original anti-skate string length, when all slack is taken out, is 83mm between the end-caps. This results in an end-cap-center to end-cap-center distance of 86mm. Rather than a bunch of knots, use two knots sealed with a drop of "Crazy Glue" to secure the string to each end cap. Fully assembled end cap and string reproductions are available from Vantage Audio in the U.K.
Electronic Adjustment of the Control Unit - Recommendations for Experienced Technicians Only! 1. Ground the Control Unit ground point to the same ground used when the unit is set up in your audio system for all adjustments! The oscilloscope baseline (Y-axis position) will vary slightly between grounded and non-grounded. You can not get a perfect correct setting on the oscilloscope for Offset During Playback if the Y-axis position is not perfect. The goal of adjusting Offset During Playback is to equalize the positive and negative voltages of the sine wave driving the motor. Therefore, the oscilloscope baseline should be equal when the unit is under adjustment compared to when it is connected for normal use. If the baseline (Y-axis position) is not correct, the final adjustment will not be correct. Adjust the oscilloscope baseline (Y-axis position) with the probe connected to SC1 for 33 1/3 rpm (or to SC2 for 45 rpm) and ground, the unit grounded the same way as when it is connected for normal use, and the Control Unit powered on. 2. Next, adjust Offset During Playback at 33 1/3 rpm and 45 rpm per the service manual instructions. This is as far as the service manual will take you in this adjustment. 3. With the scope still on, play a record that has a medium bass beat throughout the track, and adjust trim pot BO-1 at 33 1/3 rpm (by ear by varying the trim pot just a few degrees in either direction from the adjustment point obtained per the service manual directions. At one point +/- about 3 degrees from the oscilloscope set point, the bass will snap into greater depth and focus. There will be no change in the oscilloscope appearance, as the oscilloscope is too course a tool to see that tiny a difference in voltage change. (Also, if the shape of the positive half sine wave is not a perfect mirror of the shape of the negative half sine wave, merely equalizing voltages will not give the most perfect possible adjustment, which must equalize the area under the sine wave to equalize positive and negative energy in each half of the sine wave.) This final adjustment of Offset During Playback by ear and scope together, gives the most perfect adjustment possible. Next, repeat this procedure adjusting trim pot BO-2 at 45 rpm with a 45 rpm record that has a medium bass beat throughout the track. 4. The last adjustment in the service manual is for Wow and Flutter. You can also get greater accuracy on this adjustment than the service manual method by using a Wow and Flutter meter that also measures Drift. (I use a Grundig GA-1000 Wow and Flutter Meter that has an analog meter scale for Wow and Flutter as well as a digital LED readout for Drift.) The optimum adjustment point for both minimum Flutter and minimum Drift simultaneously should be very close to the factory setting. The meter is much more accurate than the ear for adjusting Wow and Flutter. I would not attempt to adjust SC-1 Gain by ear alone. 5. Adjusting SC-1 Gain can change the shape of the sine wave. Therefore, after setting SC-1 Gain, I go back and set Offset During Playback at 33 1/3 and 45 rpm again, using the methods described above. Now, the Control Unit settings are the most perfect possible, and the improvements are quite audible. This method is only a guide line. The author is not responsible for any damage that may be done to any part of the turntable, persons or anything else resulting from any servicing. This is one modification that I am opposed to for several reasons. Firstly, replacing the factory AC socket with an IEC socket eliminates the dual voltage capability of the L-07D. I suppose that if an IEC socket were added with a separate voltage selector switch, that would preserve the dual voltage capability. Secondly, upgraded power cords are available to work with the original socket. Thirdly, the L-07D should not be grounded through the power cord to house ground. The Control Unit should only be grounded to the phono stage, via the rear ground point on the Control Unit. I have seen quartz lock problems from ground loops when the chassis of the Control Unit is grounded to house ground. If you use an IEC connector, I recommend that you do not connect the center connector to anything inside the Control Unit. Finally, I am a purist and I also think the original equipment AC cord is fine for this application. Record noise comes from either dirt or surface damage. Obviously, record cleaning cannot help with surface damage. Dirt/debris/muck adherent to the grooves, which may or may not be water-soluble. -Wet both sides of LP with cool tap water. -Spray LP with a solution of clear Armor-All (non-ammonia) glass spray cleaner mixed with 4oz alcohol per bottle. -Cleanse LP that is wet with cleaning solution with a Disc Doctor brush. -Rinse LP and label protector with tap water. Step 2. Groovmaster label protector kept on and into the Ultrasonic Bath, utilizing a Bransonic 3510 Ulrasonic bath cleaner. Bath solution is 8oz of 98% isopropyl alcohol in 1 and 1/2 gallons of DW. Cycle for 5 minutes to a third of the record, or 15 minutes total. The US machine that I use can handle two records at a time with Groovmasters. Okay, obviously this takes some time, but I generally do this while multitasking including listening to music. The result is a record that is so much cleaner and quieter than any "short-cut method" I have tried. Once you give a record a good cleaning, and use a new poly inner liner, it will be many years before it needs to be cleaned again. RCM cleaning alone may not adequately clean a very dirty and/or dusty record. If you doubt this, use a velvet record brush on a RCM cleaned record. The dirtier the record was to start with, the more you will pull up with the brush. Records can be maximally cleaned without expensive commercial RCM fluids, IMO. This method is only a guide line. The author is not responsible for any damage that may be done to any record, persons or anything else resulting from using the above record cleaning method.